This post is going to be heavy on things related to automobiles. If this offends you, I recommend you reconsider what you get offended about. First off, an introduction. Spend the time to watch this video from Top Gear, where the boys go in search of the best driving road in the world. The day started off a bit rough. My international driving license was either stolen from my room, or otherwise went missing, so there was a bit of stress about whether or not I’d end up being able to rent a car. All turned out ok, it never came up. I got myself a shiny white 4 door Nissan Micra with a 1.2 liter petrol engine. And then I set out for Davos. The run up to Davos is pretty easy – autostrada most of the way. Entering Switzerland costs a bonkers €40. But, it supports some very nice roads. As you get closer to Davos, the roads get a bit more exciting, but nothing to scream about. I didn’t spend much time in Davos – ate the lunch I packed in Milan, grabbed a bottle of water, and got back on the road – just long enough to say “Oh yeah, had lunch in Davos today” .. like you do. Then the fun starts. 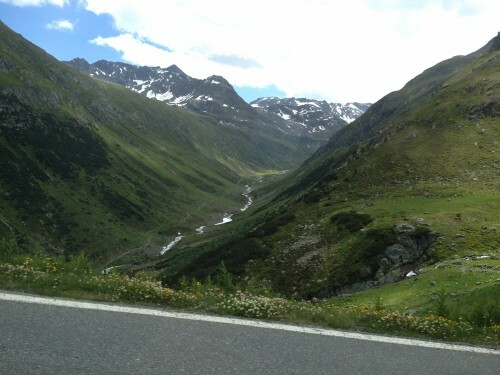 I’m struggling to put into words just how amazing the roads out of Davos are. The video gives you some idea, but doesn’t even begin to describe the scope. My route from Davos to my overnight in Lagundo was approximately 120 miles. Of that, perhaps 110 miles were amazing twisty, challenging, scary, and just completely bonkers. I got a sense of what was coming as I scoped out the parking lots of the restaurants in Davos. Fast audis and BMWs as far as the eye could see, plus a healthy helping of Italian exotica (everything from Ferrari Dinos to every modern Ferrari, etc) and lots of “track-day” specials – KTM X-Bows, loads of Lotus Seven-based cars, etc. And bikes – both motorized and not. I desperately wanted to be driving my Lotus, but also appreciated that it was very, very difficult to push the Micra hard enough to get into trouble. As in, you can’t get going fast enough between hairpins to risk overdriving the hairpin. So I drove. And drove. 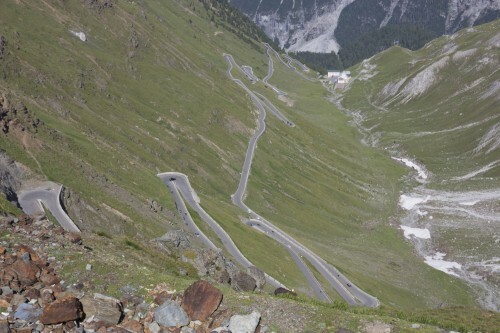 Driving the Stelvio pass itself was very special – I don’t now how many times I’ve read articles or seen videos that take place there – experiencing the madness was incredible. Interestingly, the bonkers cars mostly stayed away – a few fast audis, and some nice older metal, but mostly bikes of all types. I imagine the cars run the less populated routes. Finally, I ended up in Lagundo. Which is a very weird place. It’s all German (well, Austrian) – hardly anyone speaks Italian, let alone English. It’s a little spooky. Honestly, I’ll be glad to get back into real Italy tomorrow.